Sport utility vehicles have never been more popular with Middleton, Nova Scotia buyers. Whether compact, subcompact or full-size SUVs, every sport utility vehicle segment is growing, and that’s why consumers have plenty of quality choice when it comes to buying their next SUV. Take, for example, the 2017 Ford Edge, the Kia Sorento and the Hyundai Santa Fe. These three mid-size SUVs have a lot to offer, but if you want to have many efficient and fuel efficient engines and space Interior, the 2017 Ford Edge will be amply able to meet your needs. When choosing between the 2017 Ford Edge, the 2017 Kia Sorento or the 2017 Hyundai Santa Fe in Middleton, Nova Scotia, buyers like to have options, especially when it comes to powertrains. That's why Ford offers three engines in the new Edge. Fully redesigned two years ago, the 2017 Ford Edge is powered out of the gate by a 2.0-liter turbocharged four-cylinder engine developing 245 horsepower and 275 pound-feet of torque. Available in FWD or with the all-wheel drive, this engine has an average fuel consumption rating of 9.9 liters per 100 kilometers on average. Subsequently, the 2017 Ford Edge offers buyers in the Middleton, Nova Scotia area a 3.5-liter V6 engine developing 280 horsepower and 250 lb-ft of torque. Finally, those who want even more power will turn to the 2.7-liter V6 EcoBoost engine that offers 315 horsepower and a very impressive 350 lb-ft of torque. The 2017 Hyundai Santa Fe offers two engines, one with 185 horsepower and the other with 240 horsepower and in both cases their average fuel economy rating is higher. The 2017 Kia Sorento is powered by the same 185 horsepower and 240 horsepower engines. 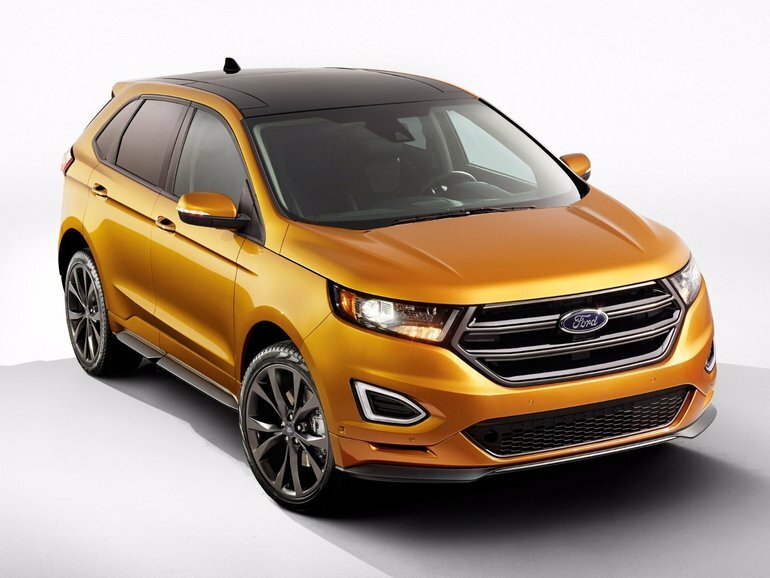 However, it also offers a V6 engine, but it develops 290 horsepower and 252 lb.-ft. of torque, or nearly 100 lb.-ft. of torque less than the twin-turbo V6 offered in the 2017 Ford Edge. The 2017 Ford Edge therefore has a slight advantage over its competition when it comes to engine options. In terms of cargo space, these three midsize SUVs are about the same. The Ford Edge offers 1,111 liters with all the seats in place which is more than the Hyundai Santa Fe, and pretty much identical to the Kia Sorento. Prices are also similar as the 2017 Ford Edge is offered starting at $ 29,699. It's a few hundred dollars more than the Sorento and the Santa Fe, so the difference will be minimal if you finance or lease your new Edge. To learn more about the 2017 Ford Edge, contact us today at Bruce Ford!